Photographing Indian weddings at the Ritz Carlton Laguna Niguel is always a treat and an adventure, as I try to create something unique for each and every client I shoot there. On this day, the greenery adjacent to the ceremony area was in particularly beautiful form, and I thought it would be a perfect complement to my bride's gorgeous custom Indian reception dress, which consisted of a series of petticoats topped with a full-length feather-light bejeweled coat. A vintage process in Photoshop helped give this image a warmer tone, and made the white sky more interesting than it might otherwise appear. I love using negative space in portraits. This wedding, which was coordinated by Nutan Shah at Elegant Events, was published in South Asian Bride magazine. 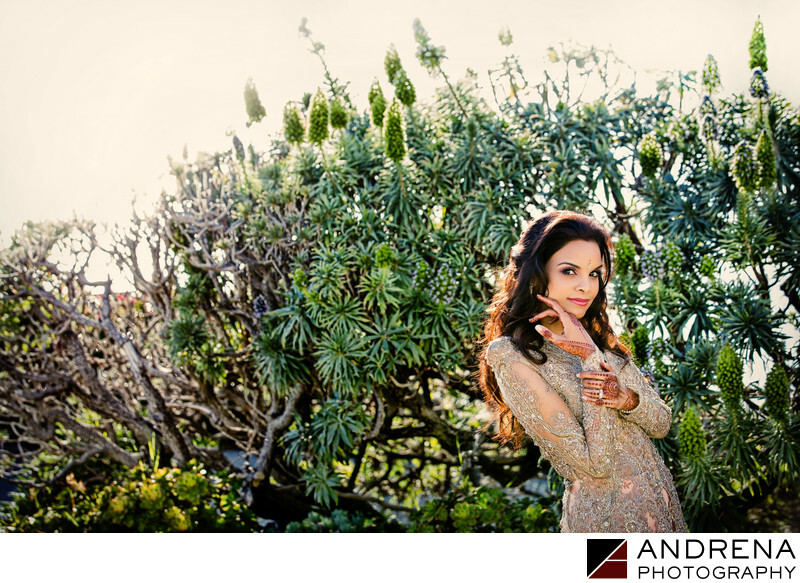 Indian wedding photographed at the Ritz-Carlton Laguna Niguel in Dana Point, California.